Terrell County is in the Big Bend area of southwestern Texas, bordered on the south by Mexico, on the east by Val Verde and Crockett counties, on the north by Pecos County, and on the west by both Pecos and Brewstercounties. Terrell County 1922. In 1905 the south end of Pecos County was detached to form the new county of Terrell, named in honor of the late A. W. Terrell. Terrell has as its southern boundary the Rio Grande, and as a portion of the eastern limit the Pecos River. In this section of Texas both the Rio Grande and Pecos cut through deep canyons, which are inaccessible, and these canyons, together with the long ranges of mountains and high mesa lands, give to Terrell County an array of magnificent scenery. Only the rather limited areas along the valleys are suitable for cultivation, but a large portion of the uplands is adapted to grazing, and the raising of sheep, cattle, horses and goats is the principal occupation of the people. The sheep industry is especially important, and Sanderson is one of the large wool shipping points in Texas. Sanderson is a freight and passenger division point on the Southern Pacific Railway, and it was in this vicinity that the engineers encountered some of the most trying difficulties in the construction of that road between San Antonio and El Paso about 1880. On the organization of the county Sanderson was made the county seat, and through this and its railway interests is a town of growing importance, furnishing most of the commercial facilities for the large area of grazing country on all sides. A number of other small shipping stations are located along the Southern Pacific, which is the only railroad. In 1910 Terrell County had a population of 1,430, including about 500 Mexicans. The assessed valuation of Terrell County in 1913 was $3,828,624, in 1920, $4,817,000. The county is one of the large divisions of Southwest Texas, with an area of about 2,750 square miles, or 1,686,400 acres. While the last census reported over 600,000 acres included in farms or ranches, only 800 acres were classified as “improved land.” The live stock enumerated included 20,330 cattle, about 3,000 horses and mules, 111,056 sheep. and 18,530 goats. In 1920, 15.033 cattle, 7,909 horses and mules, 44,731 sheep, and 22,203 goats were enumerated. There were no important agricultural statistics. – History of Texas, 1922, by W. Barrett Travis. Terrell County History from the Handbook of Texas Online. 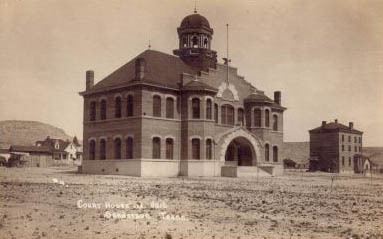 Terrell County has had only one courthouse, a Mediterranean Style building, built shortly after the county was formed in 1906. The building was remodelled in 1939 into a more modern structure.